Annalise is a no-prep, GMless table-top roleplaying game for 2-4 players. Each player takes on the role of a protagonist in a Gothic horror story - a creature, whether a literal or metaphorical Vampire - is the central pivot around which your characters revolve, and the rules of the game guide you in discovering its' nature and eventually confronting it. The game is designed for short-to-medium turn play (3-6 session), but one-shot and convention play is facilitated by the included Guided Play Scenarios. 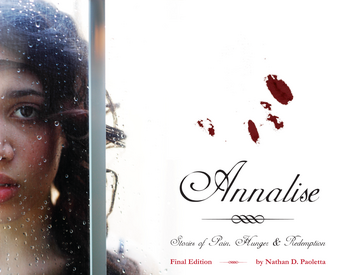 This is the Final Edition of Annalise. The entire game has been re-written, edited and expanded with additional examples and supplementary material. No-prep. Sit down and start playing immediately! GM-less. Every player has a protagonist character. Satisfying. The rules of the game create Gothic horror fiction. Annalise's Journal, a 24-page illustrated short story dripping with atmosphere. Six ready-to-play Guided Play Scenarios showcasing the diversity of the game.